The Forum Knitting Paradise has a lovely Friendship Blanket Swap that I have joined. We make 8 inch squares and send them off to our partners that we are given. My biggest problem has been trying to find an accurate pattern or an 8 inch square. So I decided to work out something myself. Any yarn can be used just use the needles appropiate for the yarn. You now have 3 stitches on the needle. KFB of first stitch and knit the rest.Do this for every row. Keep doing this until you have enough stitches to measure 11.5 inches. 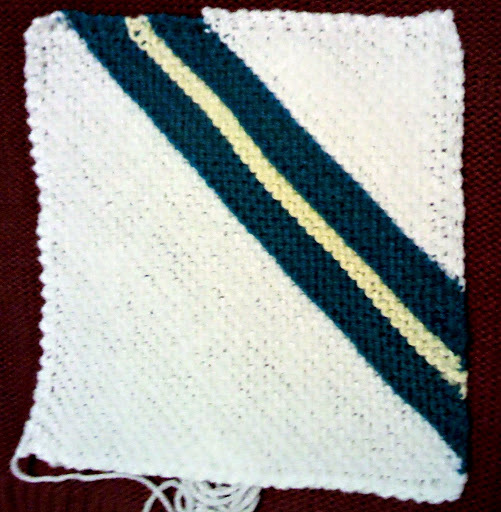 Your square is knitted on the diagonal so the 11.5 inches is half way across the square. Do this for every row until you have 5 stitches left on the needle. Bind Off the last 5 stitches. You now have an 8 inch square. Add different colours to make diagonal stripes or keep it as a solid colour. Add embelishments like a knitted flower for variety. Simple to make and knit whilst watching your favourite TV programme. This website was how do you say it? Relevant!! Finally, I’ve found something that helped me. Thanks!